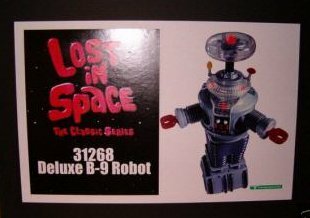 This is a Lost in Space deluxe B-9 Robot marketing/presentation board. It was used by salesmen to display at meetings, showrooms, etc.. It was used to show what the product was gonna look like. 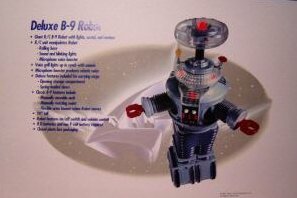 These were not available to the public, and most was thrown away afterwards. It is 20 X 15" and the upper left corner has a couple of small creases. Trendmasters has since gone out of business, making these even more rare!